PBIS is a profound focus on the positive, yet often our responses to behavior are still punitive in nature. When student behavior needs adjusting, flip the script on the old “sit by yourself desk”. 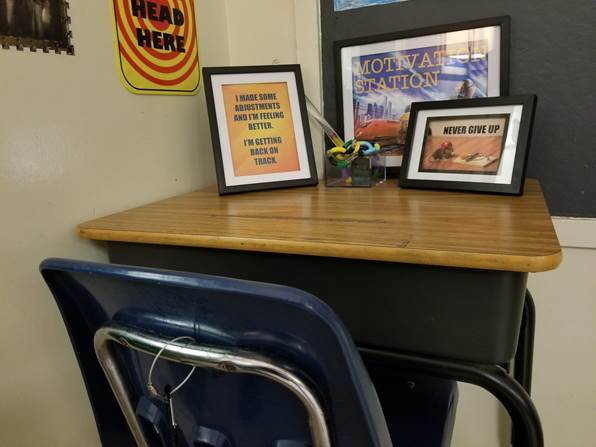 Check out this Florida classroom’s “Motivation Station”, created by adding some picture frames with needed inspiration and some fidget spinners. How about inviting students to sit there as positive reinforcement for their behavior instead of taking away their right to stay in their current seat? It’s a small shift, however, looking for ways to turn more negatives into positives will go a long way to motivate students to stay on track, and change their behavior when it’s needed.